Soldier's letter, 4 pages, 8vo., Baltimore, Maryland, July 12, 1864. 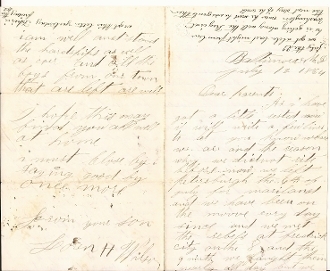 Loren H. Wilson (Co. C, 106th New York Infantry) writes to his parents pertaining to the Battle of Monocacy. "...We met the Rebels at Frederick City on the 8, and 9 ninth we fought them nearly all day..."
Very Fine. Great content letter dealing with the Battle of Monocacy.